At Ampex in 1970 I had been sent to learn the BASIC computer language at a “service bureau” – a company where access to mainframe computers was sold along with training. The instructors – quite impressed with themselves – pointed out when the terminals would hiccup and start running more slowly that the computer in Los Angeles had been turned off and the program was now running on a computer in Kansas City. To me this meant that a network of computers was a centerless medium that could make geography irrelevant. Then I was taught that files of data that we could create could be stored in the system at different levels of accessibility – denoted by the number of asterisks that preceded the file name. Three asterisks and the file could be accessed by anyone using the system, fewer meant more restricted access. I saw this as a method of creating communities of interest of different inclusiveness. I concluded that the necessary medium would be a network of computers. Information could be input from anywhere, accessed anywhere without supervision, just like speech in the town square. Communities could form around interest areas, grow, evolve, calve off or settle into stasis. People could meet through their words, exchange contact information, develop an understanding of who the other person was and in doing so improve their understanding of who they are. The possibilities for co-operative and concerted action would be real and multiple. Then I came down to earth – where would we get a computer, let alone a network of computers? The Nova minicomputer, that was no prize for ease of programming, cost the better part of $10,000 (in 1970 dollars). And networks were not cheap to set up and run, with the monopoly of the telephone company – the PYRAMID project had a 9600 baud modem that was the size of a child’s coffin – property of the phone company and available only at a monthly fee that was prohibitive for any entity but a corporation with high cash flow. By late 1971 I had made sufficient progress in therapy to consider returning to college. By that time I had heard about a group in San Francisco that had not only developed the same understanding as I had but had secured a computer to work with! I began attending their meetings. Resource One inc. was a nonprofit corporation that had evolved out of a dormant branch of the San Francisco Switchboard (the other branch had formed the Haight-Ashbury Switchboard and was quite viable). 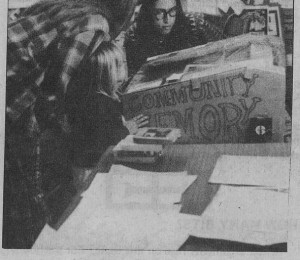 Impelled by the 1970 crisis around the invasion of Cambodia and the resulting shutdown of many universities, four computer science students from Berkeley had dropped out and moved to San Francisico to work on setting up computer access for members of “the counterculture”, of which they felt a part. Resource One’s president, Pam Hardt, was a force of nature in the area of persuasion, and had organized a campaign that had resulted in securing the “long term loan” (meaning donation) of a Scientific Data Systems SDS-940 timesharing computer along with enough money to purchase a state-of-the-art 50 megabyte hard disc drive (the size of two refrigerators). This happened because the San Francisco “establishment” – the stratum of people who made the significant decisions – were caught off-balance by the counterculture phenomenon and would cooperate with any effort that might give them some window into or handle on the phenomenon. Pam had to corner the president of the Bank of America at a retreat to berate him for inadequate largesse and press him to do better – and he did. Resource One’s plan was to create a master database shared by the varied switchboards of the Bay Area. The data would be input from the switchboards and used by all – and would no doubt have been of great interest to the establishment to understand what was going on with the wayward youth of the counterculture. There were a few problems that would require solution: the switchboards would have to pay for the rental of terminals and put up with noisy Teletypes, which would also occupy a telephone line. When we were finally ready none of the switchboards remembered us – one person had a vague recollection of hearing about us. 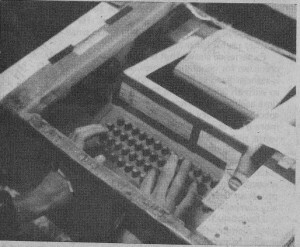 $150 per month for a Teletype rental was a non-starter. We were left without a data channel. By that time I had graduated (June 1972) and moved into the building – one of the first “warehouse communities” in San Francisco, called Project One. The day that the computer was installed the person who was supposed to train me in maintenance disappeared. I threw myself into the work but did not do enough to seek help – eventually this caught up with me and my friends had to pressure me to move out of the building. It was my attempt to submerge myself in my work and I had the opportunity to find out why that’s not the solution. A friend of mine, Efrem Lipkin, was a systems programmer and shared many of my analyses – I recruited him to work for Resource One, where he designed the Resource One Generalized Information Retrieval System – ROGIRS, which allowed the user to define index words under which and item would be stored. This was the system we offered unsuccessfully to the switchboards, and one librarian we talked with applied the analogy of a library with no books on the shelves. Efrem conceived the idea of opening an access point in public to attract “books for the shelves” – his estimate was that three topics would be represented – housing, jobs and cars – but the system was much more flexible than that. By that time, in 1973, I was living in Berkeley where Efrem also lived and we set about putting a terminal up adjacent to the campus. The student government had established a record store – the Leopold Stokowski Memorial Service Pavilion – with the express purpose of forcing down prices on LP records, at which it was successful. We appeared before the student senate to request permission to set up a terminal and found them quite receptive to the idea – it would be difficult to imagine a flint-eyed businessman making the same decision as casually. Thus, on August 8, 1973, we brought a used Teleype Model 33 to Leopolds’ Records on Durant Ave. and set it up next to a musician’s bulletin board next to the entrance (at the top of a second – floor landing). I had built a cardboard-and-foam-plastic housing to muffle the Teletype and we set up a modem to connect to a phone line we had ordered installed – this line was an Oakland exchange that was within the local (free) calling range of San Francisco, so we made only one very long call per day. We had a poster in the psychedelic genre explaining how to enter and search for items, and we had one of our number sitting next to the terminal – but there were two holes in the housing inviting the user’s hands. While we had expected a certain amount of wariness or outright hostility we found almost universal enthusiasm. “job shop” work – nowadays they would be called a W2 contractor – from a contractor who paid me a salary and placed me at clients’ locations to do their engineering work. At the time this was considered a good way to make better than average pay as long as one was flexible – it attracted a lot of newly-divorced engineers. At one job there was a policy that after three months the “job-shopper” would be made a permanent employee. I could see that they were about to go out of business and decided to become my own job shop. They bid me goodbye and were soon gone themselves, and I was self-employed as LGC Engineering. The initials stood for Loving Grace Cybernetics, a phrase Efrem sometimes used as a business name and a reference to the poem “All Watched Over by Machines of Loving Grace” written during a sojourn at Cal Tech. I figured that whatever was coming, I would be the hardware engineering arm.